When choosing a pre-school setting, a child’s health and happiness are always top of any parent’s list. Ghyll Royd provides a warm, loving environment combined with exciting and enriching activities to ignite a passion for learning. Recent developments to our curriculum have provided wider opportunities for children in our Early Years to access an independent education. With over seven acres of woodland on site, children can roam, play and discover more about their environment everyday. The weekly welly walks are a highlight for children as they expand their learning outside of the classroom. 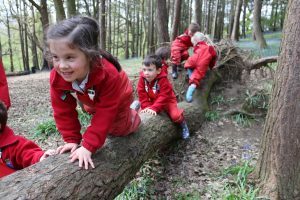 Ghyll Royd Pre-School pupils are a big part of the wider school community. The children frequently participate in assemblies, school concerts and whole school activities such as fundraisers. The older children are the best big brothers and sisters. They enjoy the role of playing with and looking after their younger peers. Give your child the best start in life with a leading education. The Pre-School is open for 36 weeks of the year, with day care offered during the holidays. We are open all year round for visits. Come along and experience our wonderful setting. Book your visit today. This article featured in Aspire Magazine January 2019.